A sunny day emerged from the horizon and the end of an exhibition loomed so, today, I took me down to Kew Garden for ‘Plantasia’. 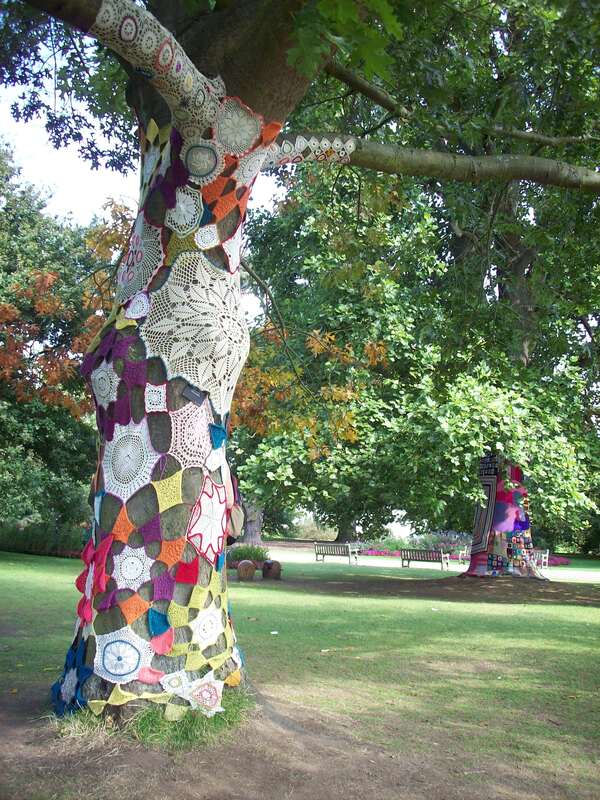 I’d heard there were knitty things there which added extra appeal on top of the planty things I wanted to see..
Now, I like a yarn-bomb as much as the next person, those pops of colour and creativity brightening up grey surrounds. I especially liked the monster feet that Knit Diss was so fond of doing (see www.knitdiss.wordpress.com/yarn-bombing-gallery/) However, I haven’t been so keen on these yarn-wrapping escapades when done on trees. I suspected it mightn’t be good for our arboreal friends. But hey! if it’s okay by the boffs at Kew, I’m slightly more won over. Though I do like to admire a tree trunk for its own beauty, and would prefer that such adornments are made for boring lamp-posts etc. These two cosified trees are the Northern Pin Oak (Quercus ellipsoidalis) and, in the distance, the Tulip Tree (Liriodendron tulipifera).The project was carried out by Knitiffi with the help of 50 knitters. ( www.knitiffi.blogspot.com ) Take a closer look and you’ll spot that there was a lot of crocheted contributions too. On the other side of the garden, I visited the Healing Giant. This display comprised raised beds in human outline, with medicinal plants growing in the body areas which they help heal. For example, in the heart region was Nasturtium (Tropaeolum majus), which has historically been applied to heart problems, and is now being researched for its potential to decrease blood pressure. 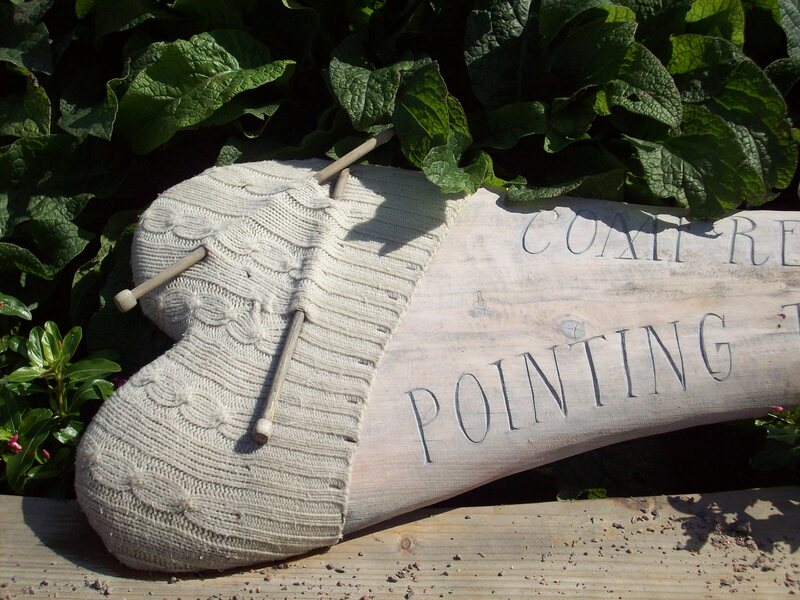 Another knitting link here is the plant Comfrey (Symphytum officinale), traditionally known as Knitbone for its reputation of mending fractures and broken bones. I once worked for a woman who swears by the stuff. She had broken her elbow and was told by her doctor that she’d never be able to straighten her arm. She treated her arm daily with Knitbone for a while and to the surprise of the doctors was able to hold her arm out flat. There’s no doubt about it in my mind – the healing powers of plants is amazing. But so too is the healing power of crochet and knitting, which has been recognised for their benefits to mental well-being.